Location: Collection stored off site: researchers must request access 36 hours before use. Language of materials: Materials in English. Abstract: Correspondence, speeches, etc., of Inez Milholland, suffragist, reformer, and lawyer. The papers of Inez Milholland were purchased by the Schlesinger Library from Norma Millay in April 1979. Access. Originals are closed; use digital images or microfilm M-80. Copyright. Copyright in the papers created by Inez Milholland as well as copyright in other papers in the collection may be held by their authors, or the authors’ heirs or assigns. Copying. Papers may be copied in accordance with the library’s usual procedures. 1. In organizing the material the processor added page numbers and dates, where necessary, to the correspondence, articles, and newsclippings. Page numbers and other information added by the processor are in square brackets. 2. Fragments of Milholland essays, articles, and speeches in folders #30, 32, and 36, were numbered and filmed consecutively. The reader should be aware, however, that the text is not always consecutive. 3. The collection included envelopes for some of the correspondence between Milholland and Eugen Jan Boissevain, and some of these have been filmed. The reader should note the following: a) envelopes filmed were left where they were originally found and do not necessarily accompany the letters they precede or succeed; and b) those included were filmed to indicate where the recipient was residing, so that only the first envelope after each change of address was filmed. Inez Milholland Papers, 1906-1916; item description, dates. MC 308, folder #. Schlesinger Library, Radcliffe Institute, Harvard University, Cambridge, Mass. Dutch women filmmakers have produced a film, “Ahoy!” that features American suffragist Inez Milholland as an example (among others) of women who continue to inspire us today. Statement from the Dutch women who produced “Ahoy!” –a work shown at two film festivals. With pride we present our film Ahoy! unsurpassed women of the world.The film is about a young woman who gets inspired by the lives of heroines. When the leadroll dreams, some heroines come to live. Eventually she makes a decision. In this film we want to honor female leadership and courage of women all over the world and show their relevance for women in our time. The idea of the film came as a result of a year project ‘Heroines Woldwide’ from our Dutch women’s organization Zeeuwse Wereldvrouwen. Our women’s group is located in the south of the Netherlands, the province Zeeland (Sealand). We live on a peninsula. We meet every week and the participants are Dutch women and women from all over the world, young and old etc. The goal of our organization is to empower women and to increase awareness in society about the role of women. We work through education, art, film, poetry, and with projects. At the moment we are working on the project Silent Voices, about violence against women. During the year-long project, “Heroines Worldwide,” all women chose a heroine from their own original country and shared it with the group. In this way we got to know many unknown heroines. We made a Wall of Fame in our room where we have our weekly meetings. For most of us, Inez Milholland was totally unknown. We were excited when we heard about her. Her story is so inspiring and visual. We definitely wanted her in our film. We found out a lot of heroines who died young and dedicated their life to womens’ rights. Making the film was a real adventure. We did everything ourselves. The film is entirely shot on iPhone. And women of our group played the heroines. We asked the community to help us with locations and horses.This project has really changed us. Actually, playing the heroines, literally crawling into their skin, changed the spirit of our group. On the 14th of February 2014, we joined the One Billion Rising movement and we went on the streets to demonstrate against violence against women and we also danced Break the Chain. With us was a Dutch heroine Aletta Jacobs (also in our film) she came to life, to demonstrate with us and hold a speech for the public. We are not to be stopped now. Thank you Inez Milholland, and all the other heroines. The film has shown at Film By the Sea in Vlissingen and Cineffable, Filmfestival International Lesbien et Feministe du Paris. Are you registered to vote? Check your status! This involves you. Check your voting status by following this link. Inez Milholland died for women’s voting rights. Make sure you are registered. Don’t take anything for grants. Sign up to receive updates from those of us determined to make sure Inez Milholland is remembered and honored in 2020 when American women will have been voting for 100 years. This is a resolution for the New Year! Let’s make sure Inez is in 2020 suffrage centennial celebrations. 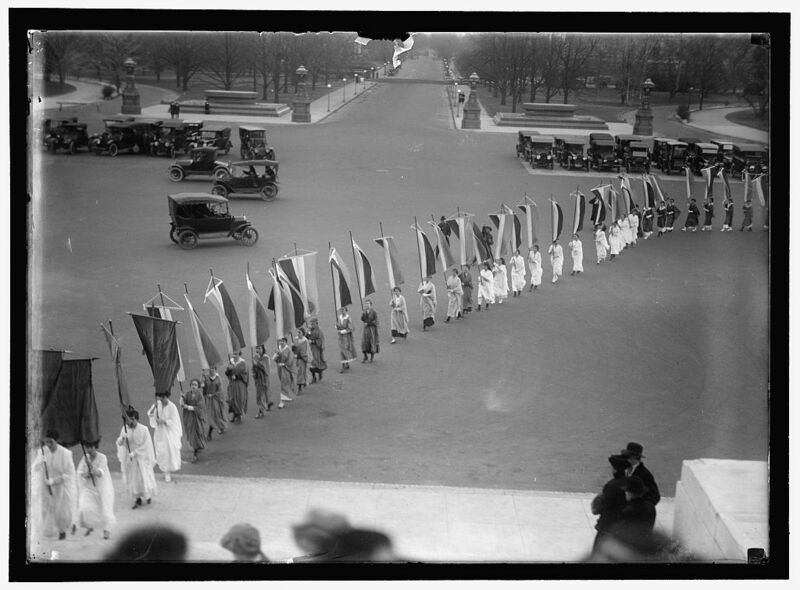 Another reminder about honoring Inez Milholland & many American women! The Turning Point Suffragist Memorial is determined to open by 2020. Christmas Day memorial service for Inez Milholland- 1916. WE ARE HERE TO PAY TRIBUTE to Inez Milholland Boissevain, who was our comrade. We are here in the Nation’s Capitol, the seat of our democracy, to pay tribute to one who gave up her life to realize that democracy. We are here that the life she gave should not be given in vain, but that the knowledge of her, the understanding of her, the sacrifice of her, and the inspiration of her should bring to fulfillment the work for which she laid down her life. Inez Milholland walked down the path of life a radiant being. She went into work with a song in her heart. She went into battle, a laugh on her lips. Obstacles inspired her, discouragement urged her on. She loved work and she loved battle. She loved life and laughter and light, and above all else, she loved liberty. With a loveliness beyond most, a kindliness, a beauty of mind and soul, she typified always the best and noblest in womanhood. She was the flaming torch that went ahead to light the way, the symbol of light and freedom. She was ever thus in the woman’s movement, whether radiant, in white, pinning the fifth star to the suffrage flag when the women of Washington were enfranchised; whether leading the first suffrage parade down Fifth Avenue, valiantly bearing the banner, “Forward into light,” or whether in the procession in our Capital four years ago, when, mounted on a white horse, a star on her brow, her long masses of dark hair falling over her blue cape, she typified dawning womanhood. Symbol of the woman’s struggle, it was she who carried to the west the appeal of the unenfranchised, and, carrying it, made her last appeal on earth, her last journey in life. As she set out upon this her last journey, she seems to have had the clearer vision, the spiritual quality of one who has already set out for another world. With infinite understanding and intense faith in her mission, she was as one inspired. Her meetings were described as “revival meetings,” her audiences as “wild with enthusiasm.” Thousands acclaimed her, thousands were turned away unable to enter. In this western land she came into her own. Something in her spirit with its intense love of liberty found a kinship in the great sweep of plain and sagebrush desert, in the bare rocky mountains and flaming sunsets. She seemed to breathe in the freedom of the great spaces. Something in her nature was touched by the simplicity and directness of the people. And so on through the west she swept with her ringing message, a radiant vision, a modern crusader. And she made her message very plain. “It is women for women now and shall be until the fight is won! “Together we shall stand shoulder to shoulder for the greatest principle the world has ever known, the right of self-government. “Whatever the party that has ignored the claims of women, we as women must refuse to uphold it. We must refuse to uphold any party until all women are free. “We have nothing but our spirit to rely on and the vitality of our faith, but spirit is invincible. Into this struggle she poured her strength, her enthusiasm, her vitality, her life. She would come away from audiences and droop as a flower. The hours between meetings were hours of exhaustion, of suffering. She would ride in the trains gazing from windows listless, almost lifeless, until one spoke; then again the sweet smile, the sudden interest, the quick sympathy. The courage of her was marvelous. The trip was fraught with hardship. Speaking day and night, she would take a train at two in the morning to arrive at eight. Then a train at midnight and arrive at five in the morning. Yet, she would not change the program; she would not leave out anything. Something seemed to urge her on to reach as many as she could; to carry her message as far as she could while there was yet time. And so on, ever, through the west she went, through the west that drew her, the west that loved her, until she came to the end of the west. There where the sun goes down in glory in the vast Pacific, her life went out in glory in the shining cause of freedom. And as she had lived loving liberty, working for liberty, fighting for liberty, so it was that with this word on her lips she fell. “How long must women wait for liberty?” she cried and fell, as surely as any soldier upon the field of honor, as truly as any who ever gave up his life for an ideal. As in life she had been the symbol of the woman’s cause, so in death she is the symbol of its sacrifice – the whole daily sacrifice, the pouring out of life and strength that is the toll of the prolonged women’s struggle. Inez Milholland is one around whom legends will grow up. Generations to come will point out Mount Inez and tell of the beautiful woman who sleeps her last on its slopes. They will tell of her in the west, tell of the vision of loveliness as she flashed through on her last burning mission, flashed through to her death, a falling star in the western heavens. But neither legend nor vision is liberty, which was her life. Liberty cannot die. No work for liberty can be lost. It lives on in the hearts of the people, in their hopes, their aspirations, their activities. It becomes part of the life of the nation. As Inez Milholland has given to the world, she lives on forever. That with new devotion we go forth, inspired by her sacrifice, to the end that that sacrifice be not in vain but that dying she shall bring to pass that which living she could not achieve, full freedom for women, full democracy for the nation. Let this be our tribute imperishable to Inez Milholland Boissevain. Inez was buried in upstate New York near her family home, Meadowmount, in Essex County, surrounded by the Adirondack mountains. 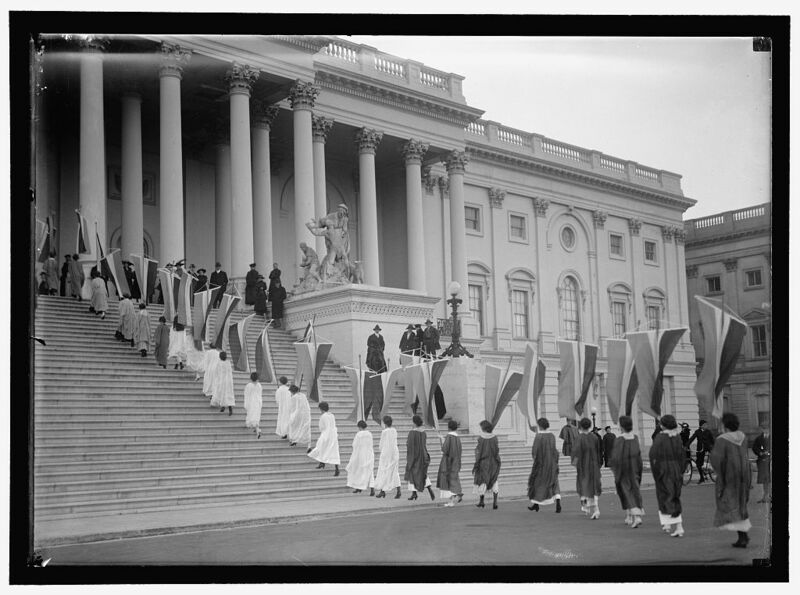 Mourners carry banners into the U.S. Capitol on Christmas Day, 1916. Listen to an account of Inez’s Memorial from Doris Stevens’ suffrage classic, “Jailed for Freedom,” at https://soundcloud.com/lets-rock-the-cradle/inez-milhollands-story-from.